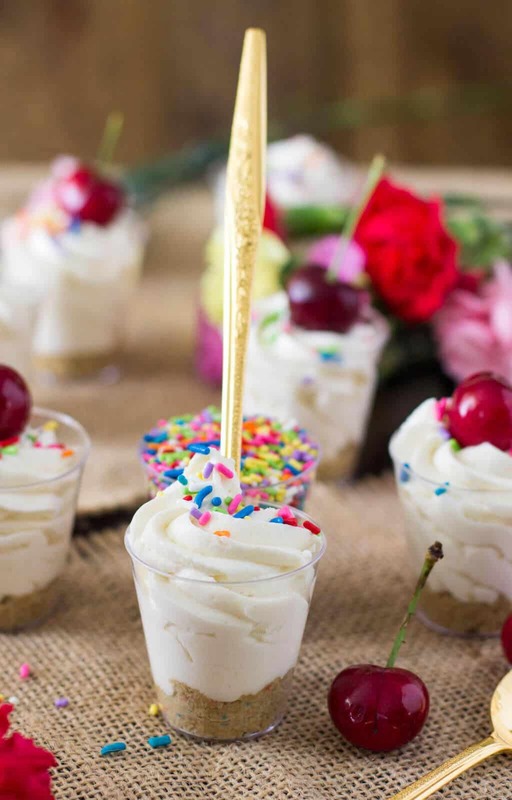 Rich, single-serving-sized Cake Batter Cheesecake Dessert Shooters are adorable little no-bake desserts packed with cake-batter flavor and then decorated with sprinkles and cherries. In a perfect world, all desserts would be miniature. They would all also have sprinkles. And no calories (of course). 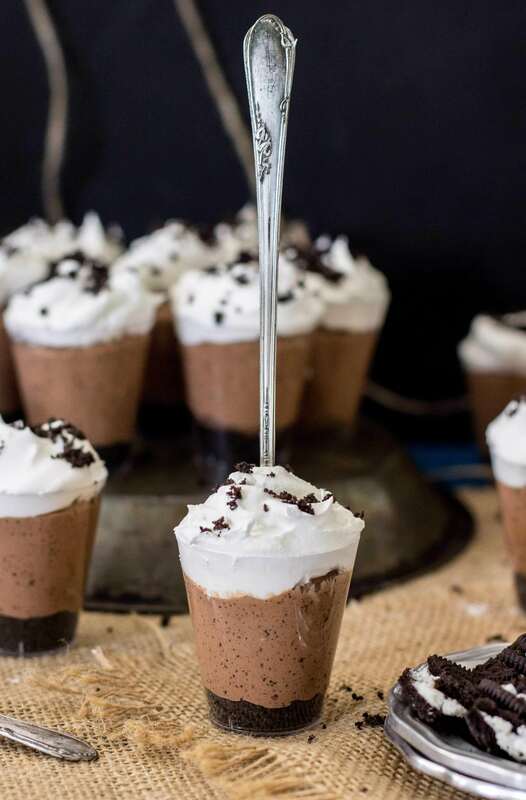 It’s not a perfect world, as the headlines of any major news outlet will quite emphatically remind you, and these cheesecake dessert shooters probably do have calories (if I don’t calculate them, though, we’ll never know for sure), but they come just as close as they possibly can to dessert perfection. 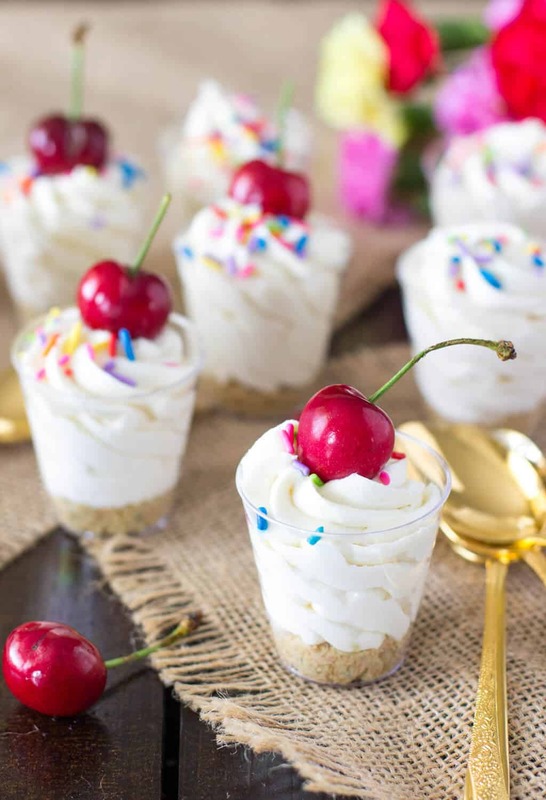 Sweet and single-serving-sized (so you can have multiple “single”-servings), these dessert shooters have all of the richness of cheesecake, packed with the fun flavor of birthday cake. Appropriately, we happened to be celebrating Zach’s brother’s birthday last weekend over at my in-law’s house. 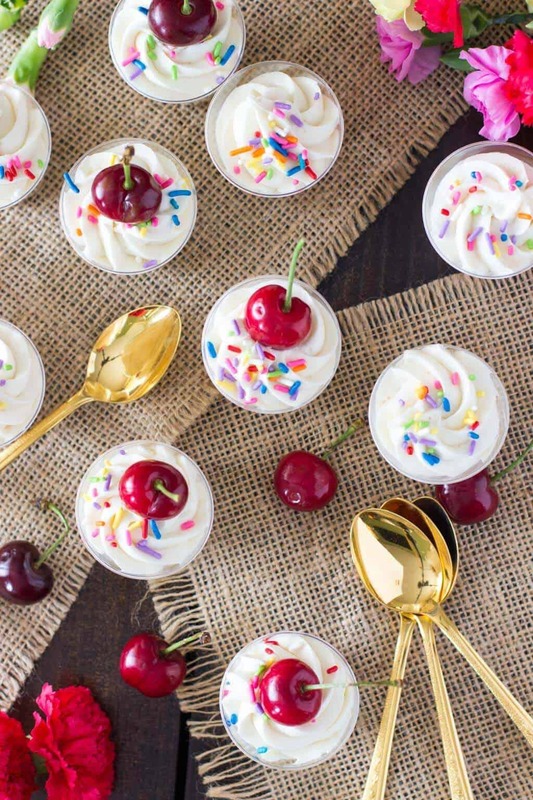 The celebration included a table piled high with heavy, steamed Maryland Crabs, and for dessert I brought along a Tupperware container crammed full of these little cake batter dessert shooters in lieu of cake. By the time we left they were nearly all gone — Zach’s brother ate about 6 of them on his own (so I think it’s safe to say they were a success). 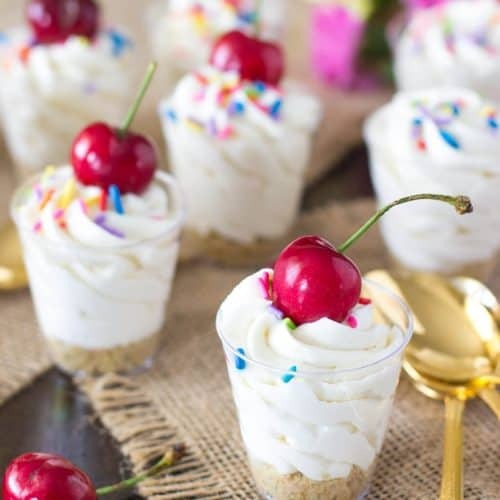 I think just about everyone picked the cherries off the tops, though… they’re optional, but they looked so perfect on top of the dessert shooters I have to recommend them! One of the reasons that I love making cheesecake desserts so much is that the cream cheese does a great job of keeping a dessert from being too sweet. 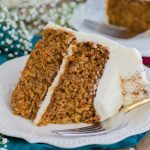 Cream cheese makes for rich desserts with a lot of flavor, and here, infused with cake batter and vanilla extract, it’s a fairly rich treat. 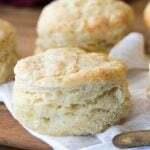 However, made single-serving-sized and lightened up with plenty of whipped cream, they’re hardly cloying or sickeningly sweet. 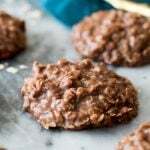 Enjoy, and let me know if you’re able to make a batch and not eat six of them yourself! 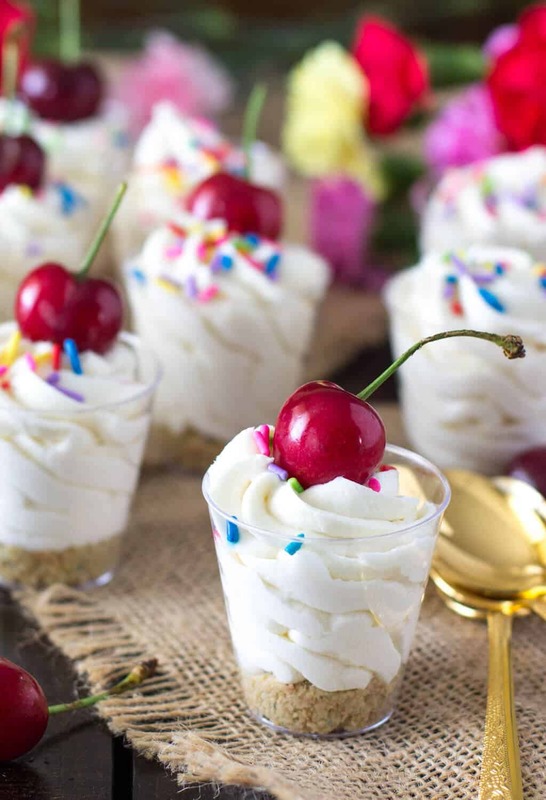 (If so, I admire your willpower and you definitely deserve another batch of these cheesecake shooters as a reward). PS. You won’t see a post from me on Friday because I’ll be in Cleveland watching the Orioles play the Indians, but I’ll be back with something (probably chocolaty, I haven’t decided for sure yet) on Monday! oz I use these 2 plastic shotglasses from Amazon. In a food processor blend your Oreos to fine crumbs. Transfer to a medium-sized bowl. Add the melted butter and use a fork to combine. 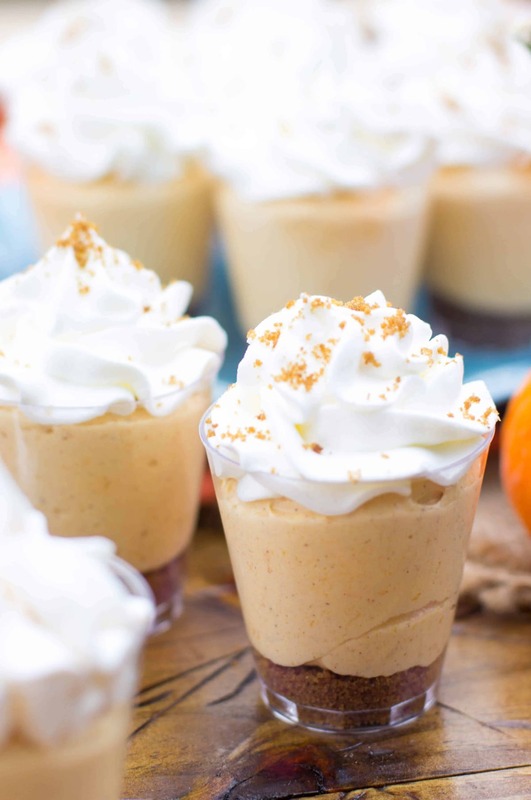 Set out 22 2-oz plastic shot glasses and use a small spoon or teaspoon to press about 1 1/2- 2 tsp of cookie crumbs into the bottom of each shot glass. 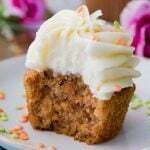 In a stand mixer or with an electric mixer stir together cream cheese and vanilla extract. 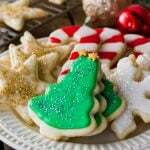 Gradually add cake mix and powdered sugar until completely combined. Scrape down sides and bottom of bowl periodically to ensure ingredients are well-combined. With mixer on low-speed, add cool whip and stir to combine. You will need to pause frequently and use a spatula to scrape the sides and bottom of the bowl to make sure it is well-combined. 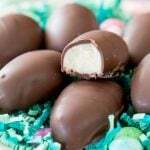 You want the filling to be creamy and smooth -- not lumpy. Transfer the filling to a piping bag fitted with a large tip (I used an Ateco 846 closed-star tip--if you do not have this tip you can simply transfer the filling to a large Ziploc bag, snip a corner off, and pipe the frosting in that way). 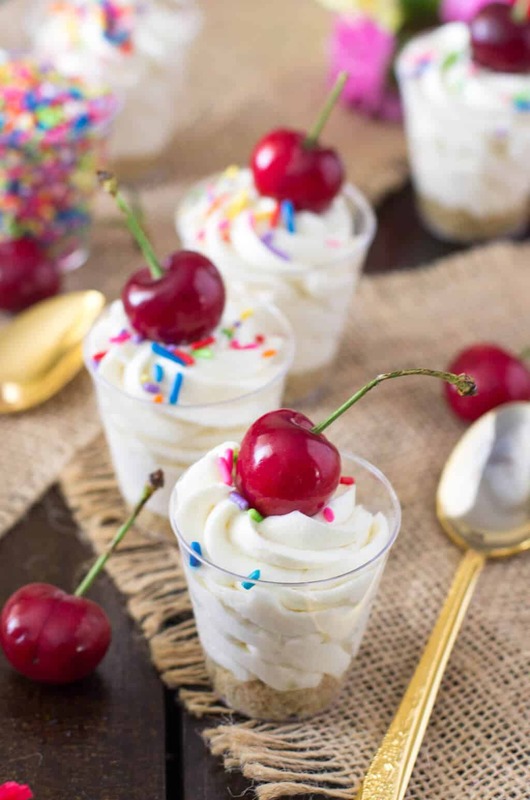 Top with sprinkles and cherries, if using, and serve. 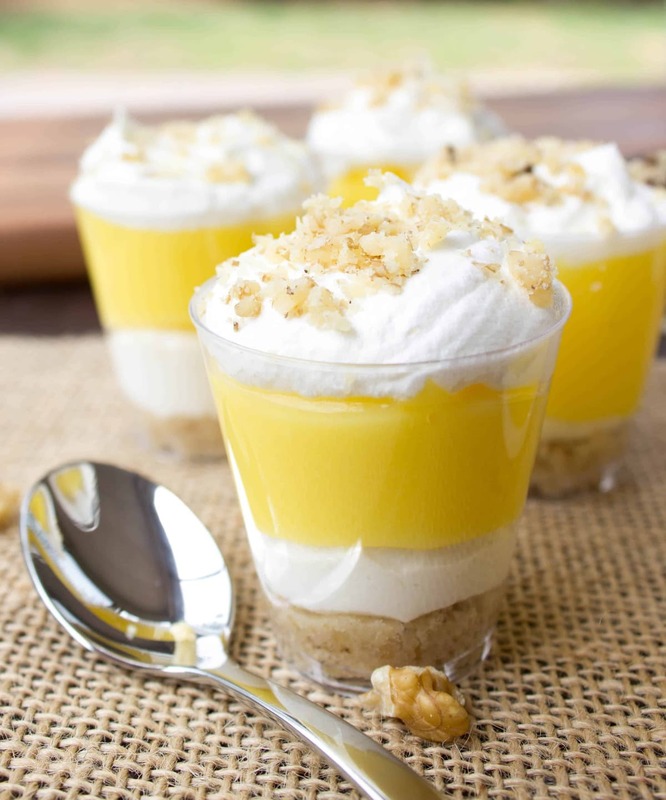 Keep any uneaten dessert shooters refrigerated in an airtight container. Do you freeze night before? I just keep them refrigerated. Do I use the dry cake mix or prepare as a batter first? 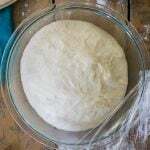 Use the dry cake mix. I hope you love them! 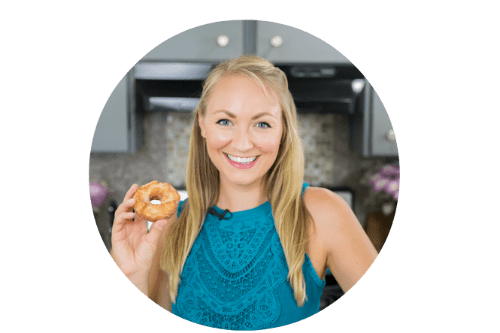 Hi Sam, Thank you for this super-delicious recipe! 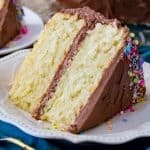 I’m a big cake and cheesecake fan, so this was a win-win, and so easy! I just put in in dessert bowls, but love the ‘shooters’ idea for a get-together. Thanks again! Thank you for coming back and letting me know how they turned out for you, Kathy! 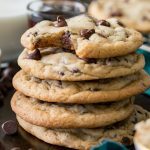 They are always a hit at our house, too! 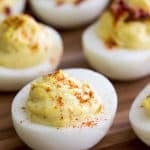 You can definitely make them the night before! I would never pick the cherry off the top. That totally makes them even more beautiful! I would be downing quite a few single servings of this. ? And I like that you link to the shot glasses. I never know where people get cute single serving cups. I definitely had quite a few servings myself 😉 and yeah, Amazon always seems to have the best prices for them, too!